President Obama cited it as one of the biggest frustrations of his presidency, and it's always a sign of bad news when it reenters the national conversation — I'm talking about the push for sensible gun control reforms. It's once again in the news, following the theater shooting in Lafayette, La., on Thursday night, which claimed two victims' lives. And while there's no guarantee that reforms would've stopped the crime, the state's governance precluded any chance: here are six times Bobby Jindal spoke against gun control. It's probably one of the most rigid, strictly policed issues within the Republican Party, alongside hot-button conservative positions like opposition to abortion, and anti-taxation. That's in no small part thanks to the lobbying influence of the National Rifle Association, which holds Republican members of Congress (and some pro-gun Democrats, too) accountable by scoring votes. Jindal has made his reputation as a vociferous pro-gun rights advocate for years, so there's no reason to expect him to stop now, even as he's suspended his campaign following the Lafayette shooting. Here are six times he's made his feelings about gun control painfully obvious. 1. "Those Of Us Who Refuse To Give An Inch..."
Back in 2013, Jindal took the time to sign six gun-related bills into law on one day. As the New Orleans Times-Picayune detailed, Jindal was in the midst of a statewide tour, and hailed himself as a staunch defender of the Second Amendment. It is a great day in Louisiana and across this nation for those of us who refuse to give an inch when it comes to defending our right to protect our families and we will stand strong in the defense of the Second Amendment. ... Responsible, law-abiding citizens should not be villainized simply because they are concealed carry permit holders. The bill he's chiefly referring to one barring the publication of the names and addresses of gun permit holders, a response to such a list being released by The Journal News earlier in the year. But that's not all he'd approved — he also passed a bill allowing gun dealers to offer voter registration to buyers at the point of sale, and another allowing for the issuance of lifetime concealed handgun permits. 2. Calling President Obama's Post-Charleston Commentary "Shameful"
In the aftermath of the deadly, racist shooting at Emanuel AME Church in Charleston, S.C., in June, President Obama once again voiced what he's said so many times: that America should pass sensible gun control measures. Jindal was not pleased about this, suffice to say, calling it "shameful" in a subsequent interview on Fox News. I think it was completely shameful. Within 24 hours of this awful tragedy, nine people killed at a Bible study in a church. Now, let's stop and think about that. Nine people coming into the church who are saying — to praise God, to study's God Scripture, gunned down. This monster then says he is going leave some victims alive so they can go tell the world what he has done. Within 24 hours, we have got the president trying to score cheap political points. You have to give Jindal this much: he knows his audience. While speaking at the NRA's national conference in Nashville, Tenn., earlier this year, he wove his pro-gun rhetoric together with his religious freedom rhetoric, according to The Tennessean. Now, I know you did not come here today expecting to hear a speech on religious liberty. But my friends, if these large forces can conspire to crush the First Amendment, it won't be long before they come after the Second Amendment. 4. Calling The Democrats "Gutless"
While speaking at an Indianapolis NRA conference in 2014, as detailed by The Hill, Jindal accused the Democrats of opposing the Second Amendment, but lacking the courage to be up front about it. There's a familiar theme here — when pro-gun rhetoric is his job for the day, he tends to use pretty aggressive language. This time, calling the Democrats "gutless." Now these folks on the left, they are audacious, but I'll share a secret with you. They are also gutless. They refuse to admit their real agenda. The truth is Michael Bloomberg, Eric Holder, so many of President Obama's wealthiest liberal backers in Hollywood do not in fact believe in the Second Amendment at all. He also reportedly accused Democrats of viewing gun owners and NRA supporters as "dumb rubes." 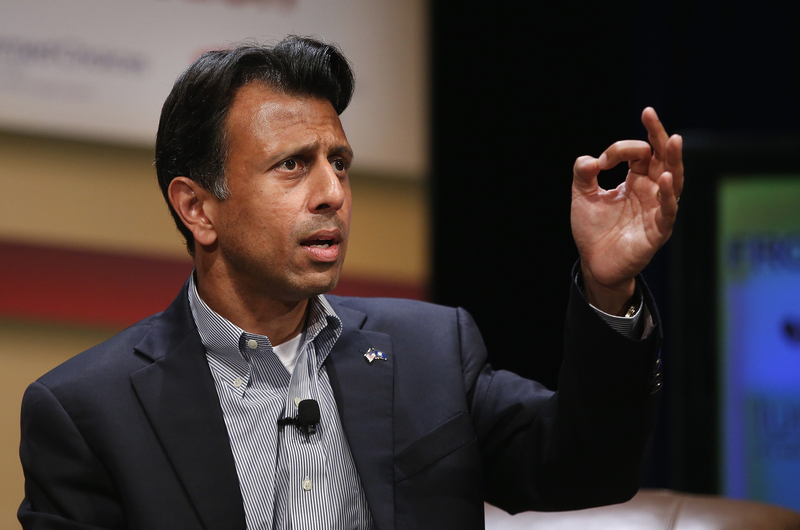 Back in February, Jindal took to Twitter to warn his gun-enthusiast followers of a looming disaster. The proposal he was referring to was aimed at getting a couple especially dangerous, armor-piercing forms of ammo out of circulation — "M855 green tip" and "SS109" bullets, according to PBS. These rounds were once only fireable from rifles, which earned them a sporting exemption from prior armor-piercing ammo bans, but nowadays there are handguns that can fire them, too. Of course, as is so grimly familiar with all things gun control, the effort went nowhere. It was dropped after a reported 291 lawmakers, and other state politicos like Jindal, cried foul. During his speech at the 2012 Conservative Political Action Conference (CPAC), Jindal dusted off one of the Republican right's longest-standing anti-Obama rallying lines — namely, a reference to Obama's infamous 2008 remark about people who "cling to guns or religion or antipathy to people who aren't like them," which became a line of attack for then-Democratic rival Hillary Clinton. Four years later, Jindal used the reference to make his gun-loving ways as plain as possible, as The Washington Post detailed. He characterized folks like us — like you and me — as unsophisticated ingrates who were, and I quote, bitterly clinging to our guns and religion. He was exactly right about us. In Louisiana and all across America, we love us some guns and religion.